The Forest of Bowland offers some of the most beautiful and remote walking in the country, from the grandeur and isolation of the moorland hills to the undulating lowlands with their distinctive pattern of settlements, woodland cloughs and river valleys. These landscape contrasts, along with the serenity and tranquility of the area make this a walker’s paradise. We hope that these walking routes will give you the opportunity to explore and enjoy this beautiful area but please be aware that this is a living landscape and changes may well occur along the routes themselves over time. Should you encounter any problems with one of the promoted download routes please contact the AONB unit on 01200 448000 or email bowland@lancashire.gov.uk. Please also be aware that many of the walks covered by these download routes pass through farmland where there is likely to be livestock. See our Walking Safely information below and advice given on the National Farmers Union website. Dress appropriately - avoid denim and any other clothing that doesn't dry quickly. It is better to wear lots of lighter layers, which can be removed or added. Sturdy footwear and waterproofs are also a must. Carry the right equipment including an Ordnance Survey map (OS Explorer OL41); compass; first aid kit; high energy snack; something to drink; mobile phone (be aware that coverage can be patchy); whistle. Always let someone know where you're going and what time you expect to be back. If you are in difficulty or see someone in difficulty, please dial 999 and ask for Mountain Rescue. From a gentle stroll or relaxing picnic, to a long distance walk or heart pumping adventure, the countryside provides every opportunity for enjoyment and relaxation. If you follow the Countryside Code wherever you go, you'll get the best enjoyment possible and you'll help to protect our open spaces now and for future generations. Ticks are tiny creatures called parasites which feed on the blood of lots of types of animals and sometimes people. They travel by walking on the ground and up plants, or are transported by birds and animals, then they wait for an animal or person to pass by, drop onto it or hook onto it with special hooks on their legs. 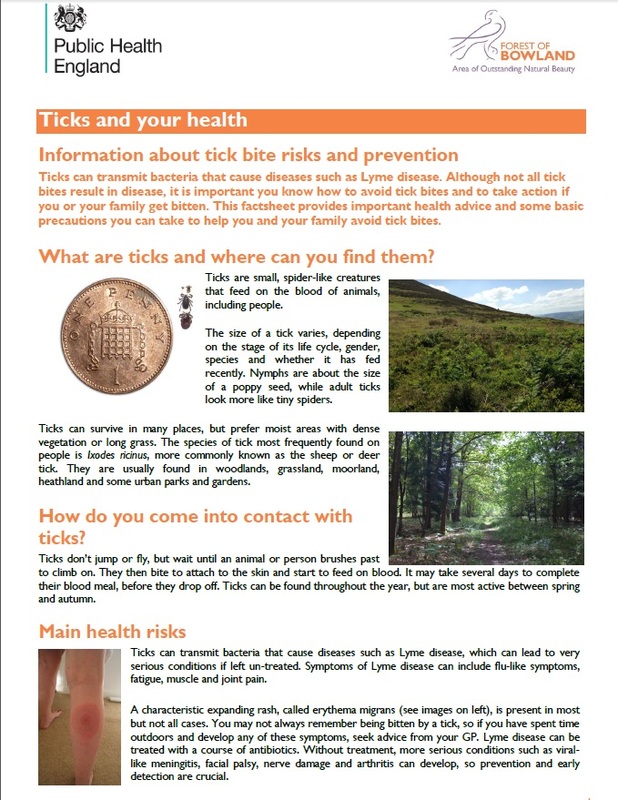 Ticks vary in colour and in size, depending on the type of tick, whether it is male or female, and whether it is a baby, juvenile or an adult. Ticks are very tiny, with the largest (unfed) tick being 3mm. Why are ticks a risk to people and pets? Ticks normally choose wildlife and farm livestock to be their hosts. However, people and pets send out the same signals as the tick's usual hosts. Some ticks can carry organisms in their saliva. When they bite, the saliva can enter the bloodstream of the host and this can make them ill.
Because winters are warmer, and because there have been changes in farming methods, as well as other factors, there are more ticks about. Ticks are also spreading into new places where they weren't found before. Because of this, and because more people tend to be involved in outdoor activities, a greater number of people get bitten by ticks. This means that more people get diseases from the ticks. The Ribble Way follows the river from the sea near Preston to its source high in the fells of the Yorkshire Dales; 70 miles of delectable walking through an ever varied landscape. For convenience it is divided into seven easy sections with comprehensive descriptions of places passed en route such as Preston, Ribchester, Stonyhurst, Clitheroe, Settle and Horton. For those who do not wish to tackle the whole route, each section makes an easy day’s walk. The Pendle Way is a 45 mile circular walk in 8 sections passing through villages like Barnoldswick, Earby and Newchurch-in-Pendle. There are also 6 smaller circular walks along the route. Information about the Pendle Way is contained in a special information pack available from Nelson Tourist Information Centre. Telephone 01282 692890. A multi-user route roughly following the River Lune from Glasson near Cockerham to Lancaster and on to Bull Beck near Caton. The section between Lancaster and the Bull Beck Picnic Site follows the banks of the River Lune and is suitable for disabled users. It follows the route of the former Lancaster to Wennington railway and is approximately six miles in length. Car parking facilities are available at Lancaster, Ladies Walk, Denny Beck, Crook O'Lune, Bull Beck, Conder Green and Glasson Dock. A leaflet on the cycle way is available from Tourist Information Centres. Listed below are a series of pdfs that provide detailed information on other walks in the Forest of BowlandAONB. This attractively illustrated pack details 5 walks in the area to the east of Longridge. It includes circular walks on Longridge Fell and between Longridge and Ribchester "in the footsteps of the Romans", together with a linear walk over Longridge Fell to Chipping. Copies of the packs are available for £3 from Clitheroe and Preston Tourist Information Centres, Longridge Library and Longridge Post Office. Organised walks (brisk or not) can have a health impact on individuals by providing an opportunity to socialise (good social networks enhance health) and a distraction from everyday stresses (stress contributes to poor health). Walking for Health has more than 590 health walk groups across England. Supported by Natural England the groups meet for regular short walks every week. Anyone can turn up and join in - it's free and fun. Walk4Life is part of the Change4Life movement that has been set up to encourage families and adults to eat well, move more and live longer, by making small lifestyle changes that add up to big health benefits.